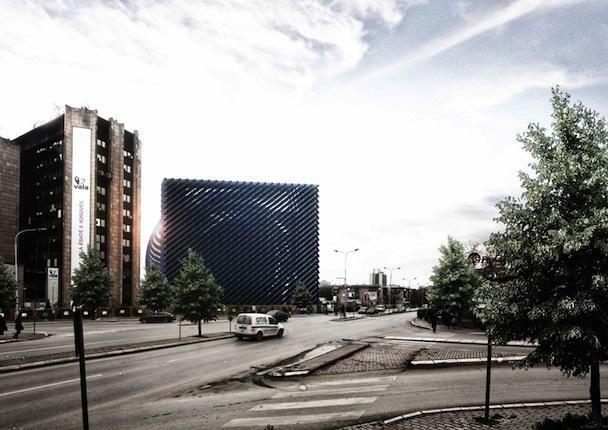 The monolithic building proposal by Italian architect Paolo Venturella becomes a urban fulcrum for the city of prishtina in Kosovo. 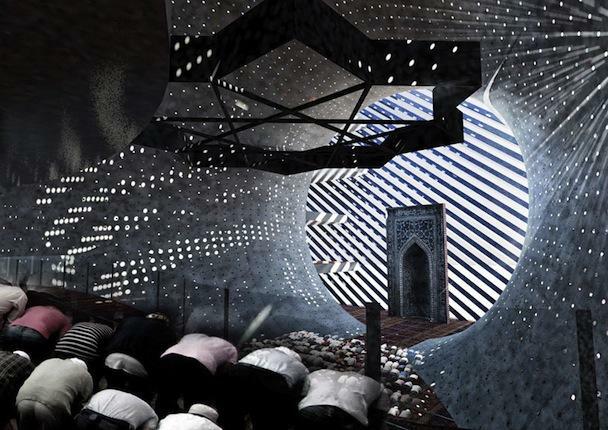 By merging the two main elements of the mosque – the ‘kiblah wall ‘dome’ – the plan indicates a direction for users to pray, creating a communal space for people to unite. From a geometric point of view, the mosque – which faces the Mecca – can be seen as a sphere that extrudes out from the wall. the prayer hall is divided into two separated rooms, accommodating a smaller area for praying from monday to thursday, and a larger space for friday and festivals. 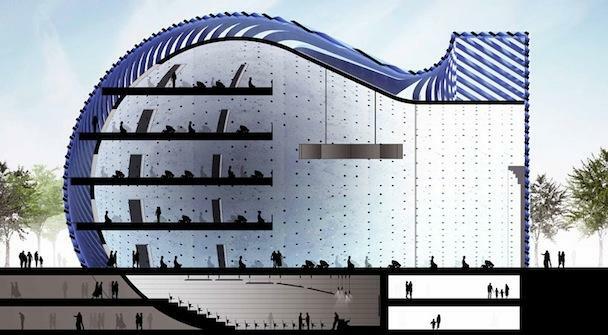 Both sections are designed on multiple levels, bringing men and women together at different levels. educational, social, administrative and commercial areas are separated from the sacred space above. The shape of the envelope is conceived as a ‘double-skin’ – generating a circular intervention around the prayer hall. 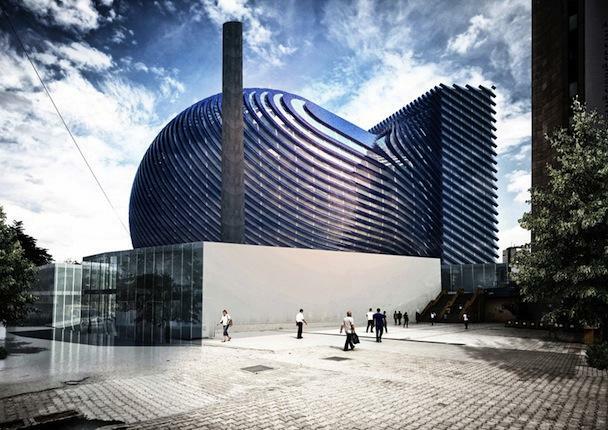 Made with a series of louvers, the facade is covered with thin photovoltaic film that harvests energy for the mosque and the other services. Pedestrian area taking advantage of the spherical shape, the curved form guarantees a surface perfectly oriented to the sun during all the day so to optimize the radiation of the sun. These tilted shaders avoid the direct passage of sunlight creating indirect illumination and allow the view to outside. the southern facing ‘kibla wall’ works as a greenhouse element that captures heat and releases it to the interior when needed during colder periods. The team design: Paolo Venturella, Angelo Balducci, Luca Ponsi and Paolo Gaeta. ( 5elected from www.designboom.com ) For more information or to get in touch with the Italian architects, just follow the link bellow.